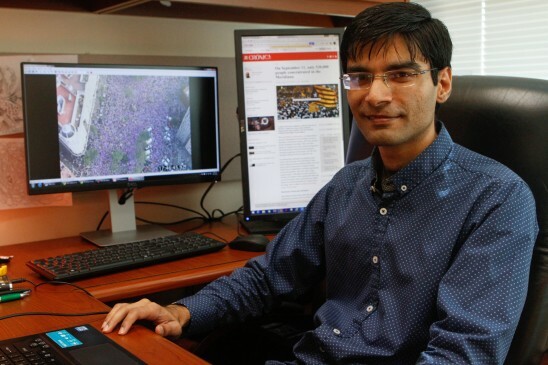 Computers have scanned aerial photographs and conducted the first automated mass-crowd count in the world, thanks to the work of researchers at the University of Central Florida. Counting large-scale crowds (such as the Million Man March in Washington, D.C.) has been a long, tedious process involving people examining aerial photographs one at a time. Until now, each photograph had to be divided into sections and the examiners counted the number of heads per inch. But now, UCF’s Center for Research in Computer Vision has created software that promises to automate the process and cut down the time dramatically, from up to a week to 30 minutes, giving organizers critical information when planning for events or responding to emergencies. UCF’s test run was conducted in September. Thousands of demonstrators along a 3.2-mile stretch of Barcelona were calling for the independence of the Catalonia province from Spain. Using the new software, 67 aerial images of different sections were analyzed. The software program came up with a total count for each of the images within 30 minutes. The images and calculations were then sent to Pompeu Fabra University in Spain, where statistics professor Albert Satorra led a team in reviewing the data. Using UCF results for the images, they concluded the count for the entire crowd at about 530,000. That number is well below the count claimed by rally organizers, said Haroon Idrees, a post-doctoral associate at the UCF center who conducted the analysis that was sent to Satorra. Crowd counts have been done digitally before, but not for large-scale crowds involving hundreds of thousands of people. The discipline is important because knowing the size of crowds can help organizers plan for events and can also help them have appropriate staffing available for emergencies. Computer vision is an amazing field. It is great to see it used in large-scale crowd counting.